The Northern Ireland Council for Voluntary Action (NICVA) has added its voice to the calls for the UK to remain in the European Union. NICVA Chief Executive, Seamus McAleavey said “NICVA believes the outcome of the referendum will have far-reaching effects on all the people of Northern Ireland. First and foremost we are encouraging people to use their vote. Don’t leave this decision to others because it seems difficult or remote. The outcome of the vote on the 23rd of June affects all our futures. 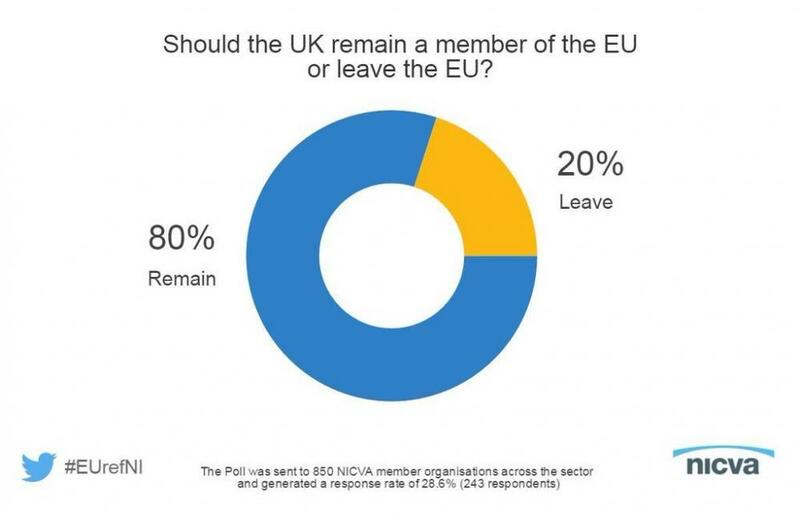 “NICVA believes, on balance, Northern Ireland is better remaining in the EU for economic and social reasons. “Our status as a member of the EU means we can trade freely with other members producing better results for business and consumers. Internationally our EU membership means we have free trade deals with over 50 other countries around the world. It’s hard to envisage how the UK outside of the EU could develop similar trade arrangements without pre-conditions. Why would the EU give a non-member UK as good a deal as its members? “The EU has also been a stabilising force for Peace in Europe and showed solidarity with Northern Ireland right from the start of the Peace process. That was not simply by its generous contribution of Peace funds but its actual understanding of our political problems which it recognised as part of wider Europe’s own history. “Many of the social policies promoted and supported by the EU are important to NICVA members across Northern Ireland. The EU is at the forefront of tackling poverty by, amongst others things, supporting access to skills and employment, helping people with disabilities into training and employment and promoting workers’ rights. “Food safety and fairness for consumers on things like roaming charges are all driven by the EU and the EU is leading the way when it comes to environmental protection and sustainability. “It is also wrong to say the EU is run by faceless bureaucrats. Its Commission is nominated by Member States, its Council of Ministers are serving Prime Ministers of member states and we, the people, elect its Parliament. “To support leaving is to take a huge risk, a leap into the unknown but likely to have a detrimental impact on attracting foreign investment into Northern Ireland”. For more information on how and why NICVA reached this position click here.